MBBS (London), FRCS (Eng), FRCS (Ed), FRCS(Plast). 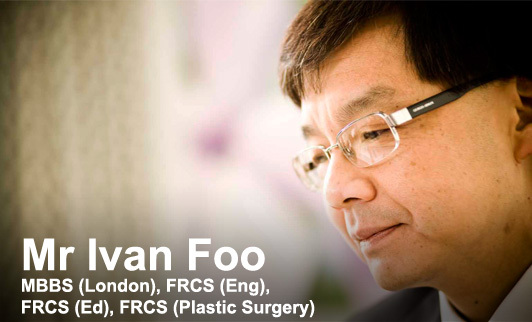 Mr. Ivan T H Foo was appointed as an NHS Consultant Plastic Surgeon in 1993 and has established an outstanding reputation in the private sector as a leading cosmetic and reconstructive surgeon. Mr. Foo is a well established member of the British Association of Plastic & Reconstructive Surgeons (BAPRAS) and the British Association of Aesthetic Plastic Surgeons (BAAPS) and is registered with the General Medical Council (GMC) on their Specialist Register for Plastic Surgery registration number 02611493. Mr Foo has a special interest in cosmetic facial surgery (facelifts, blepharoplasty, rhinoplasty), cosmetic breast surgery and body contouring surgery. Mr Foo is very well regarded in the Yorkshire community for his understanding approach towards cosmetic surgery patients and his excellent cosmetic surgery results. Mr. Foo's NHS practice is based at the Bradford Teaching Hospitals where he carries out Reconstructive Plastic Surgery, specialising in Breast Reconstruction. For a major part of his NHS appointment Mr Foo also carried out complex head and neck surgery and reconstruction. His Private Practices are based at The Yorkshire Clinic in Bingley and The Spire Elland Hospital in Halifax. Mr. Foo provides regular consultation clinics at both private hospital's and his secretary will be delighted to take enquiries from new patients who would like to consult with Mr. Foo on 01274 550847 if you would like a consultation at the Yorkshire Clinic or 01422 324065 for the Spire Elland Hospital. Information on Hospitals, Bookings and Private Consultations in a relaxing atmosphere with a highly reputable medical and surgical consultant. This section contains details of procedures available within Mr Foo's practice.